Although all recent iPods, and both iPhone models, require a USB connection to sync with your computer, until this year’s models you could still charge Apple’s media players via a FireWire connection. But beginning with the iPhone 3G, and continuing with the second-generation iPod touch, the fourth-generation iPod nano, and presumably all future models, USB is now required for both syncing and charging. 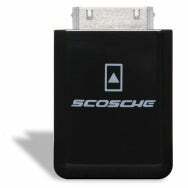 If you’ve been bitten by this change to the iPod and iPhone's hardware—and based on feedback we’ve received from readers and complaints we’ve seen around the Web, quite a few people have—there’s a solution that doesn’t involve replacing your equipment: Scosche’s $30 Passport. But while the Passport is advertised as an accessory for car audio systems, it also works with other accessories. For example, if you have an affected iPod speaker system, you just place the Passport in the system’s dock cradle and then dock your iPod or iPhone onto the Passport. In my testing with a range of older iPod accessories, the Passport worked well, letting me charge and play the latest iPod and iPhone models. The Passport even worked with the new video-output circuitry on these iPod and iPhone models, which require dock-connector video accessories to include special “authentication” circuitry; accessories that included this circuitry successfully accessed the player’s video output through the Passport. Of course, when using the Passport with dock-cradle accessories, the fit isn’t nearly as nice as if you were placing the iPod or iPhone directly in a dock cradle; you’ll want to make sure the accessory provides some sort of support for the player to avoid putting too much strain on the connector. And because the Passport is thicker than Apple's dock-connector plug, it may not work with all iPod or iPhone cases. Finally, $30 may seem pricey for what is essentially a charging adapter. But the Passport is one of the first solutions we've seen for this annoying incompatibility (the other, which I hope to test soon, is from CableJive). And if it works for you, it’s a bargain compared to the alternative of replacing an expensive audio system.